Lacerations- When do you need to call the veterinarian? 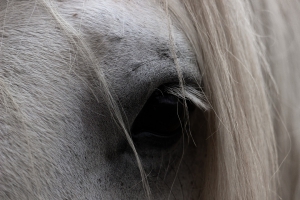 As horse injuries go, cuts, scrapes, and bruises of all shapes and sizes are common – the challenge is learning when veterinary intervention is required. One of the most critical factors for laceration severity is the location of the laceration. A solid “rule” to keep in mind is that if the wound is over an area that “bends” and appears to be fully through the skin, it justifies at minimum a call, and likely a visit from a veterinarian. Cuts that seem to be no big deal, but are located directly over a joint, can be disastrous for the horse, while something that looks horrible at first glance but only involves skin and muscle can heal without causing any problems. The lower limbs of horses don’t have a lot of tissue between the skin and the joints or bones. This “lack of padding” makes it easy for a cut that looks simple to penetrate into the joint. 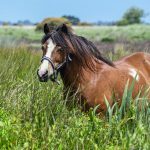 Joints open to the outside world are open to infections and if infected, can become debilitating for a horse due to the arthritis associated with the process. 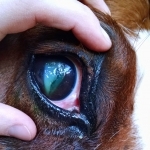 Severely traumatic wounds, where tissue (skin, muscle) have been damaged or are just missing, can greatly benefit from prompt veterinary attention. Proper removal of tissue and thorough cleaning of these wounds will speed the healing process significantly. Though some of the skin may be missing from a wound like this, with some creative suturing, what remains can be used as a natural bandage, even if only temporarily. At times, if healing is taking a longer than expected, there is justification for skin grafting techniques, even in an ‘in the field’ situation. Though the head can heal quite well on its own, lacerations to the eyelid region and around the eyes often warrant closer examination. If your horse has an injury like this and they have no desire for you to even look, much less touch and clean the wound (which a fairly common response! ), please call your local veterinarian so that things can be tended to (likely with sedation). Trying to fight with the horse can quickly lead to other issues or injuries. 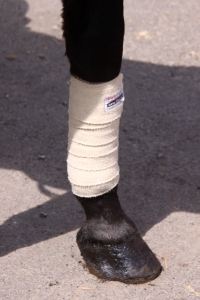 With sedation these wounds can be treated without further injury to the horse or any humans. Do NOT wash the wound with the hose. This can force dirt and debris deeper into the wound. Using a paper towel or gauze with dilute betadine, clean the wound of obvious dirt and debris. If the wound has potential to get dirty again before the veterinarian arrives, place a light bandage over the wound. If there is a chance that the wound will need suturing or stapling, DO NOT use anything “blue or purple in color.” While efficient at stopping bleeding, these dusts and powders can be very damaging to healthy tissue and create a larger mess than before. If your vet is not going to see the wound, and it doesn’t need a full bandage, a little bit of ointment (triple antibiotic is good) will help to keep the wound clean and moist. If bandaging, make sure there is “padding” between the skin and any “vetwrap” like product. As always, if there is any question, give your veterinarian a call. 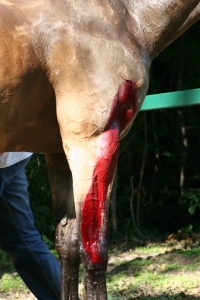 After a conversation you can both make a decision of whether your horses’ laceration should be seen or not.